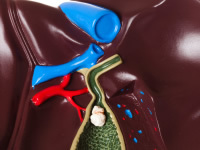 The liver is one of the most important organs in our bodies, playing a central role in a number of important processes. One of these is to help control glucose concentration in the blood (i.e. regulating blood glucose levels). A healthy liver helps keep blood glucose within the ‘normal range’ and protects against excessive fluctuations, which is vital as high blood sugar (hyperglycemia) and low blood sugar (hypoglycemia) can both be dangerous for the human body. The liver is the largest internal organ of the human body, weighing approximately 1.4 kg (3 lb) in the average adult. Located under your diaphragm (more to the right side of your body), it is a wedge-shaped, spongy organ that performs a number of key functions, including regulating blood sugar levels, getting rid of toxins (body detoxification) and bile production. It also acts as a major filter of the blood travelling from the digestive tract to the rest of the body. The body responds to stress by releasing hormones from the adrenal glands within the kidneys. These hormones travel within the blood to the liver and trigger the liver to release some of its stored glycogen. Release of glucose into the blood is part of the body’s ‘fight or flight’ response, preparing the body with energy to be able to quickly respond to a threat or stressful situation. As glucose is taken up by the muscles, the liver releases glucose into the blood. The liver can only store a certain amount of glucose and so if strenuous exercise is sustained, the body will need to get its energy from other sources. The liver is responsible for regulating cholesterol levels in the blood. The liver is able to produce and release cholesterol into the blood and also can remove cholesterol from the bloodstream. When cholesterol is removed from the blood, the liver converts cholesterol into bile salts. A damaged liver can cause a number of serious health problems as it is responsible for so many important functions of the human body. A common sign of a damaged liver is a condition called jaundice, which is a yellowness of your skin and eyes that occurs when bilirubin - a yellow breakdown product of your red blood cells - builds up in the blood. If left untreated, the damage could become severe enough to stop the liver functioning altogether, in which case you would have less than a day to live. Non-alcoholic fatty liver disease is a diabetes-related condition which causes the build-up of excess fat in your liver. This condition occurs in at least 50 per cent of people with type 2 diabetes and close to half of those with type 1 diabetes, and, unlike other liver problems, is not linked to alcohol consumption. The presence of non-alcoholic fatty liver disease is known to raise the risk of liver inflammation or scarring (cirrhosis), and is also associated with an increased risk of liver cancer and heart disease. If you are diabetic and are diagnosed with non-alcoholic fatty liver disease, your GP may recommend an ultrasound inspection of your liver upon diagnosis, followed by regular blood tests to monitor your liver function.